PURPOSE: To mitigate the impacts of emerald ash borer within the state by removing at-risk ash wood and trees prior to the onset of widespread ash mortality. BACKGROUND:The emerald ash borer (EAB) is an invasive species that rapidly spreads killing millions of ash (Fraxinus) trees. It was officially discovered in New Jersey in May 2014 in Somerset County. State and Federal quarantine zones have been established to regulate the movement of ash trees and wood to prevent human-induced spread of EAB into new areas. The State Forest Service has identified heavily populated areas of ash trees in our state parks and forests, especially in high use areas or areas visited by park patrons. One such park is the D&R Canal State Park. PROJECT SUMMARY: New Jersey State Forest Service and State Park Service are working together to mitigate the impacts of the EAB within the state by removing at-risk ash (infested or near infested) prior to the onset of widespread ash mortality. 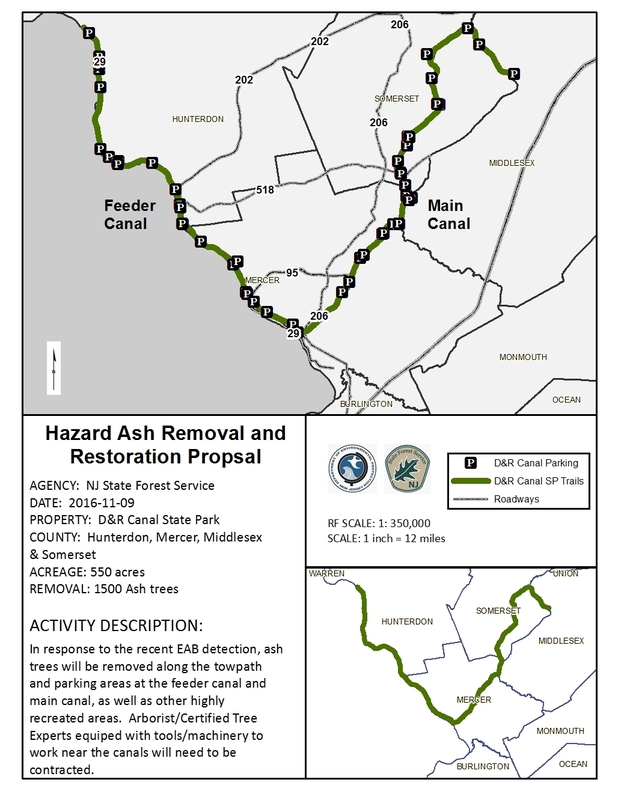 Approximately 1500 ash trees have been identified within the D&R Canal State Park that are at risk to EAB attack. Whole tree removal is necessary within the high-use areas to reduce hazard trees and to combat EAB. As logging operations are not feasible due to size of machinery, the course of action consists of hiring a professional tree service company to chip small diameter trees and tree tops. Trees that are too large for chipping will be left on site in log lengths of 8 feet to prevent the movement of solid wood outside the infected area. Restoration will then take place by planting tree whips or seedlings in various locations. Potential seedlings to be planted are swamp white oak, sycamore, black gum, and sweet gum at a rate of 500 trees per acre. Once the ash trees are removed, areas with invasive species and other competing vegetation such as Japanese stitlgrass and Japanese barberry will be spot-treated using herbicide applied by a licensed applicator. BENEFITS: Removal of the infested ash trees will decrease the mortality rate over time and the replanting efforts will contribute to a healthier forest ecosystem. FUNDING: ONRR is funding this project at the cost of $484,000 to cover the removal and planting efforts. SCHEDULE: The project will take place over a 5-year period and was started in late winter/early spring of 2017. The work must be coordinated around the timing restrictions for threatened and endangered species.